Primaries on 7th June 2016 – which news publishers were able to win? On 7th June, the primaries took place in California, Montana, New Jersey, New Mexico, and in North and South Dakota. The interested public particularly watched California. The most populated state and another chance for Bernie Sanders to keep the Democrats’ internal campaigning open. However, Hillary Clinton won these primaries, and now Hillary Clinton and Donald Trump are likely to represent the presidential candidates of the Democrats respectively Republicans. 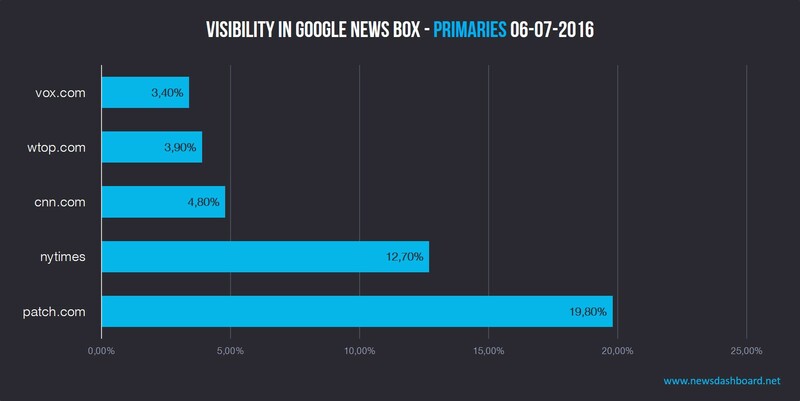 With the help of our News Dashboard’s data we analysed which online publishers ranked in the different relevant Google News Boxes for the primaries, and also which publishers are the winners of the primaries. We looked at both the classic desktop News Boxes and at the data for the mobile news results, which are now evaluable in detail through the News Dashboard. All in all, we analysed the ranking for 22 different keywords in the Google News Box for the mentioned days. 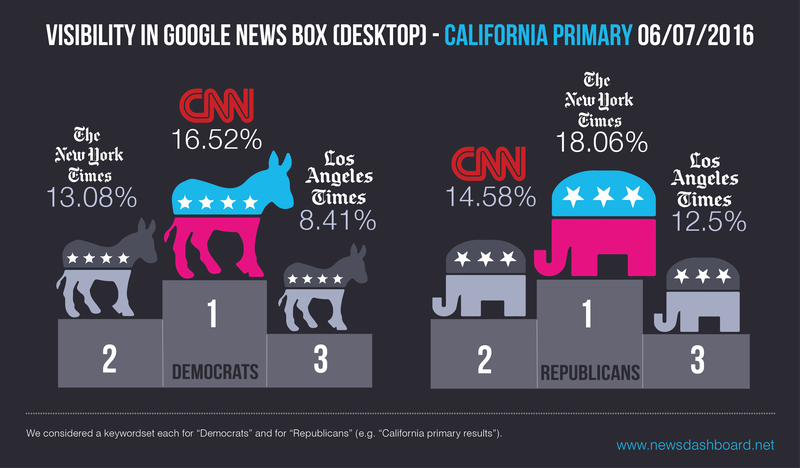 Let’s start our analysis with the results of the Google News Boxes concerning the California primaries. We analysed the names of the Democrat candidates as well as various combinations of words for the day of the primaries, 7th June. The following graph shows that CNN wrapped up the primaries in California before The New York Times and The LA Times. Cnn.com was represented in 16.5 percent of the News Boxes at least one time, nytimes.com in 13 percent, and latimes.com in 8.4 percent. Those publishers were already leading during the last primaries, so no surprise here. We see a similar picture regarding the first three positions of the mobile results. Cnn.com leads with 10.5 percent before latimes.com with 9.3 percent. Nytimes.com makes it to the third place with 9 percent regarding their mobile SERP rankings in the news box. That means that in this case, the mobile News Boxes do not vary much from the desktop results when it comes to the ranking publishers. If we expand the set of keywords regarding the democratic primaries to all six states though, there is a different picture concerning the ranking in the Google News Boxes. Patch.com turns up with a number of 19.8 percent and is the clear winner on 7th June, followed by nytimes.com with 12.7 percent, and cnn.com with “only” 4.8 percent. Places 4 and 5 are covered by wtop.com and vox.com – both publishers did not get this far in the analysis for California. Furthermore, we looked at the results for the day before the primaries and the day of the primaries concerning the complete set of keywords (including “Donald Trump”). Prior to the primaries, some other publishers were indeed able to rank in the Google News Boxes for the various keywords. Looking at the time-span from 6th-7th June, patch.com before nytimes.com and cnn.com cover the first three places. Then follows realclearpolitics.com; a publisher that was not visible often in the Google News Boxes yet. On the fifth place for both days, there is cbsnews.com. Looking at the California primaries concerning the ranking of the publishers in the Google News Boxes, there are not many surprises at first glance. Cnn.com, nytimes.com and latimes.com already got high percentages during former primaries. 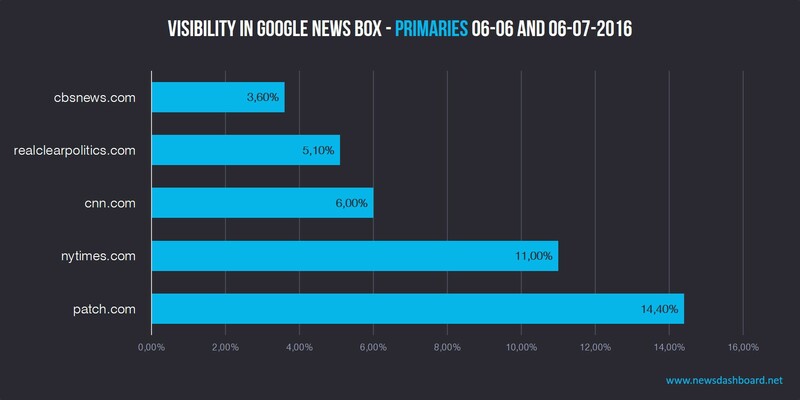 Looking at the mobile results for the primaries also leads to rather few variations of the ranking publishers. Things look totally different though, when the set of keyword is expanded, and the other primaries are included. On the one hand, patch.com and realclarpolitics.com turn up – two publishers which were not very visible in the Google News Boxes so far. On the other hand, patch.com is even able to push The New York Times and CNN off the first place on 7th June with the extended set of keywords. This is rather unusual, and it shall be interesting to see whether this publisher will be able to reach such strong numbers for other occasions.